All 2017 General Officer assignments for the Army, Air Force and Marine Corps. Army, Air Force, and Marine Corps with a pay-grade of O-7 and above are known as General Officers. General Officer ranks include Brigadier General (one-star), Major General (two-star), Lieutenant General (three-star), General (four-star). Maj. Gen. Ronald P. Clark, chief of staff, U.S. Army Pacific, Fort Shafter, Hawaii, to commanding general, 25th Infantry Division, Schofield Barracks, Hawaii. Maj. Gen. Leon N. Thurgood, deputy commander, Combined Security Transition Command-Afghanistan, U.S. Forces-Afghanistan, Operation Freedom’s Sentinel, Afghanistan, to director for test, Missile Defense Agency, Redstone Arsenal, Alabama. Brig. Gen. (Promotable) Patrick W. Burden, program executive officer, Enterprise Information Systems, Fort Belvoir, Virginia, to deputy commander, Combined Security Transition Command-Afghanistan, U.S. Forces-Afghanistan, Operation Freedom’s Sentinel, Afghanistan. Brig. Gen. Alfred F. Abramson III, deputy program executive officer, ammunition; and senior commander-Picatinny Arsenal, Picatinny Arsenal, New Jersey, to program executive officer, ammunition; and commanding general, Picatinny Arsenal, Picatinny Arsenal, New Jersey. Brig. Gen. Peter B. Andrysiak Jr., deputy commanding general (support), 25th Infantry Division, Schofield Barracks, Hawaii, to chief of staff, U.S. Army Pacific, Fort Shafter, Hawaii. Brig. Gen. Robert B. Davis, special assistant to the director, strategy, plans and policy, Office of the Deputy Chief of Staff, G-3/5/7, U.S. Army, Washington, District of Columbia, to senior defense official; and defense attaché-China (U.S. Pacific Command), Defense Intelligence Agency, China. Maj. Gen. David G. Bassett, program executive officer, Ground Combat Systems, Warren, Michigan, to program executive officer, Command, Control and Communication (Tactical), Aberdeen Proving Ground, Maryland. Maj. Gen. Ronald J. Place, co-lead, Health System Project Management Office; and special assistant to the commanding general, U.S. Army Medical Command/The Surgeon General, Washington, District of Columbia, to director, National Capital Medical Directorate, Defense Health Agency, Bethesda, Maryland. Brig. Gen. (Promotable) Brian P. Cummings, program executive officer, Soldier, Fort Belvoir, Virginia, to program executive officer, Ground Combat Systems, Warren, Michigan. Brig. Gen. Anthony W. Potts, deputy commanding general, U.S. Army Research, Development and Engineering Command; and senior commander, Natick Soldier Systems Center, Natick, Massachusetts, to program executive officer, Soldier, Fort Belvoir, Virginia. Col. (Promotable) Michael R. Eastman, special assistant to the director of the Office of Business Transformation, Office of the Under Secretary of the Army, Washington, District of Columbia, to deputy director for operations, National Joint Operations Intelligence Center, Operations Team Four, J-3, Joint Staff, Washington, District of Columbia. Col. (Promotable) Vincent F. Malone II, deputy to the deputy assistant secretary of the Army for plans, programs, and resources, Office of the Assistant Secretary of the Army (Acquisition, Logistics and Technology), Washington, District of Columbia, to deputy commanding general, U.S. Army Research, Development and Engineering Command; and senior commander, Natick Soldier Systems Center, Natick, Massachusetts. Maj. Gen. Ferdinand B. Stoss, director, operations and communications, Headquarters Air Force Global Strike Command, Barksdale Air Force Base, Louisiana, to commander, Twentieth Air Force, Air Force Global Strike Command, Francis E. Warren Air Force Base, Wyoming. Brig. Gen. Stephen L. Davis, who has been selected for the grade of major general, from special assistant to the chief of staff, Headquarters U.S. Air Force, Pentagon, Washington, District of Columbia, to director, operations and communications, Headquarters Air Force Global Strike Command, Barksdale Air Force Base, Louisiana. Brig. Gen. Kenneth P. Eckman, chief, Office of the Defense Representative, Office of the Defense Representative-Pakistan, U.S. Central Command, U.S. Embassy, Islamabad, Pakistan, to vice commander, First Air Force (Air Forces Northern), Air Combat Command, Tyndall Air Force Base, Florida. Brig. Gen. Trent H. Edwards, director, programming, Financial Management and Comptroller, Headquarters Air Force Space Command, Peterson Air Force Base, Colorado, to director, budget operations and personnel, Office of the Deputy Assistant Secretary for Budget, Office of the Secretary of the Air Force, Pentagon, Washington, District of Columbia. Maj. Gen. John E. Cardwell, U.S. Army Reserve, special assistant to the commander, North American Aerospace Defense Command, U.S. Northern Command for Reserve Matters, Peterson Air Force Base, Colorado. Maj. Gen. Darrell J. Guthrie, U.S. Army Reserve, Commander (Troop Program Unit), 104th Training Division (Leader Training), Joint Base Lewis-McChord, Washington, to commanding general (Troop Program Unit), U.S. Army Civil Affairs and Psychological Operations Command, Fort Bragg, North Carolina. Maj. Gen. Thomas S. James Jr., to assistant chief of staff, C-3/J-3, United Nations Command, Combined Forces Command, U.S. Forces Korea, Republic of Korea. He most recently served as commanding general, 7th Infantry Division, Joint Base Lewis-McChord, Washington. Maj. Gen. Kenneth H. Moore, U.S. Army Reserve, special assistant to the commander, U.S. Africa Command, Germany. Brig. Gen. Douglas F. Anderson, U.S. Army Reserve, currently serving as commander (Troop Program Unit), 9th Mission Support Command, Fort Shafter, Hawaii. He most recently served as director, Army Reserve Engagement Cell (Troop Program Unit), Fort Shafter, Hawaii. Brig. Gen. Daniel J. Christian, U.S. Army Reserve, deputy commander (Troop Program Unit), 412th Engineer Command (Mission Support Element), Vicksburg, Mississippi, to Commander (Troop Program Unit), 412th Engineer Command, Vicksburg, Mississippi. Brig. Gen. Joseph D’Costa, U.S. Army Reserve, deputy chief of staff, G-3 (Troop Program Unit), 75th Training Command, Houston, Texas, to reserve deputy director for joint force development, J-7, Joint Staff, Suffolk, Virginia. Brig. Gen. Michael R. Fenzel, deputy commanding general (support), 82d Airborne Division, Fort Bragg, North Carolina, to director, CJ-5, Resolute Support Mission, North Atlantic Treaty Organization, Operation Freedom’s Sentinel, Afghanistan. Brig. Gen. Ural D. Glanville, U.S. Army Reserve, Assistant Judge Advocate General, Operations (Individual Mobilization Augmentee), Office of the Judge Advocate General, to commander (Troop Program Unit), U.S. Army Reserve Legal Command, Gaithersburg, Maryland. Brig. Gen. Dustin A. Shultz, U.S. Army Reserve, commander (Active Guard Reserve), 505th Military Intelligence Brigade (Theater), Camp Bullis, Texas, to commander (Troop Program Unit), 1st Mission Support Command, Fort Buchanan, Puerto Rico. Brig. 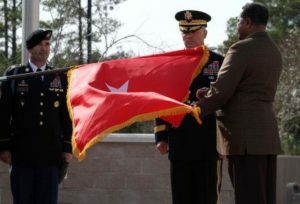 Gen. Tony L. Wright, U.S. Army Reserve, commander (Troop Program Unit), 1st Brigade, Southern Training Division, Houston, Texas, to deputy commanding general, 88th Regional Support Command, Fort McCoy, Wisconsin. Col. William B. Dyer III, U.S. Army Reserve, deputy commander (Troop Program Unit), U.S. Legal Command, Gaithersburg, Maryland, to assistant judge advocate general, operations (Individual Mobilization Augmentee), Office of the Judge Advocate General, Washington, District of Columbia. Col. Matthew P. Easley, U.S. Army Reserve, Chief of Staff (Troop Program Unit), 335th Signal Command, East Point, Georgia, to deputy commanding general – cyber (Troop Program Unit), 335th Signal Command (Theater), East Point, Georgia. Col. Brian E. Miller, U.S. Army Reserve, commander (Troop Program Unit), 302d Maneuver Enhancement Brigade, Westover Air Reserve Base, Chicopee, Massachusetts, to deputy commander (Troop Program Unit), 412th Engineer Command (Mission Support Element), Vicksburg, Mississippi. Brig. Gen. Lance R. Bunch, principal military assistant to the Secretary of Defense, Office of the Secretary of Defense, Pentagon, Washington, District of Columbia, to director, CJ35, Future Operations, Headquarters Resolute Support, U.S. Central Command, Kabul, Afghanistan. Maj. Gen. Stephen N. Whiting, director of integrated air, space, and cyberspace and intelligence, surveillance and reconnaissance operations, Headquarters Air Force Space Command, Peterson Air Force Base, Colorado, to commander, 14th Air Force, Air Force Space Command, Vandenberg Air Force Base, California. Brig. Gen. Paul E. Bauman, deputy director, future joint force development, J-7, Joint Staff, Suffolk, Virginia, to senior defense official and defense attaché-Pakistan, U.S. Embassy, Islamabad, Pakistan. Maj. Gen. Thomas W. Geary, assistant deputy chief of staff, intelligence, surveillance and reconnaissance, Deputy Chief of Staff, Intelligence, Surveillance and Reconnaissance, Headquarters, U.S. Air Force, Pentagon, Washington, District of Columbia, to military deputy to the director, Defense Intelligence Agency, Washington, District of Columbia. Brig. Gen. Joel D. Jackson, senior special assistant to the commander, U.S. European Command, and Supreme Allied Commander, Europe, Mons, Belgium, to special assistant to the commander, Air Mobility Command, Scott Air Force Base, Illinois. Brig. Gen. Michael G. Koscheski, chief, Strategic Planning Integration Division, Deputy Chief of Staff, Strategic Plans, Programs and Requirements, Headquarters U.S. Air Force, Pentagon, Washington, District of Columbia, to director, Air Crew Crisis Task Force, Deputy Chief of Staff, Operations, Headquarters, U.S. Air Force, Pentagon, Washington, District of Columbia. Maj. Gen. Robert D. Labrutta, commander, Second Air Force, Air Education and Training Command, Keesler Air Force Base, Mississippi, to director, Military Force Management Policy, Deputy Chief of Staff, Manpower, Personnel and Services, Headquarters, U.S. Air Force, Pentagon, Washington, District of Columbia. Maj. Gen. Timothy J. Leahy, commander, Curtis E. LeMay Center for Doctrine Development and Education; and vice commander, Air University, Air Education and Training Command, Maxwell Air Force Base, Alabama, to commander, Second Air Force, Air Education and Training Command, Keesler Air Force, Mississippi. Maj. Gen. Michael D. Rothstein, deputy assistant secretary for plans, programs, and operations, Bureau of Political-Military Affairs, Department of State, Washington, District of Columbia, to commander, Curtis E. LeMay Center for Doctrine Development and Education; and vice commander, Air University, Air Education and Training Command, Maxwell Air Force Base, Alabama. Maj. Gen. Brian J. McKiernan, commanding general, U.S. Army Fires Center of Excellence and Fort Sill, Fort Sill, Oklahoma, to deputy commanding general, XVIII Airborne Corps, Fort Bragg, North Carolina. Maj. Gen. Michael C. O’Guinn, U.S. Army Reserve, to deputy surgeon general for mobilization and reserve affairs (Individual Mobilization Augmentee), Office of the Surgeon General, Falls Church, Virginia. He previously served as commanding general (Troop Program Unit), Medical Readiness and Training Command, San Antonio, Texas. Maj. Gen. Wilson A. Shoffner, Jr., director of operations and director, rapid equipment fielding, Army Rapid Capabilities Office, Office of the Assistant Secretary of the Army (Acquisition, Logistics and Technology), Washington, District of Columbia, to commanding general, U.S. Army Fires Center of Excellence and Fort Sill, Fort Sill, Oklahoma. Maj. Gen. John C. Thomson III, commanding general, 1st Cavalry Division, Fort Hood, Texas, to deputy commanding general, III Corps, Fort Hood, Texas. Brig. Gen. (Promotable) Steven W. Ainsworth, U.S. Army Reserve, commander (Troop Program Unit), 7th Mission Support Command and deputy commanding general, 21st Theater Support Command, Germany, to commander (Troop Program Unit), 377th Theater Sustainment Command, Belle Chasse, Louisiana. Brig. Gen. (Promotable) Paul T. Calvert, deputy commanding general (maneuver), 1st Cavalry Division, Fort Hood, Texas, to commanding general, 1st Cavalry Division, Fort Hood, Texas. Brig. Gen. (Promotable) Bruce E. Hackett, U.S. Army Reserve, commander (Troop Program Unit), 451st Sustainment Command (expeditionary), Wichita, Kansas, to commanding general (Troop Program Unit), 80th Training Command (The Army School System), Richmond, Virginia. Brig. Gen. (Promotable) James B. Jarrard, director, Pakistan and Afghanistan Coordination Cell, J-5, Joint Staff, Washington, District of Columbia, to commander, Special Operations Joint Task Force-Operation Inherent Resolve, Kuwait. Brig. Gen. (Promotable) Miyako N. Schanely, U.S. Army Reserve, commanding general (Troop Program Unit), 102d Training Division (Maneuver Support) and deputy commanding general for mobilization and training (Individual Mobilization Augmentee), U.S. Army Maneuver Support Center, Fort Leonard Wood, Missouri, to commander (Troop Program Unit), 416th Engineer Command, Darien, Illinois. Brig. Gen. Paul H. Fredenburgh III, commandant, The Dwight D. Eisenhower School for National Security and Resource Strategy, National Defense University, Washington, District of Columbia, to director for command, control, communications and cyber, U.S. Pacific Command, Camp Smith, Hawaii. Brig. Gen. Matthew W. McFarlane, to senior military assistant to Deputy Secretary of Defense, Washington, District of Columbia. He most recently served as deputy commanding general (operations), 82d Airborne Division, Fort Bragg, North Carolina. Brig. Gen. Andrew M. Rohling, deputy commanding general (support), 10th Mountain Division (light), Fort Drum, New York, to deputy chief of staff for operations, Allied Rapid Reaction Corps, North Atlantic Treaty Organization, United Kingdom. Col. (Promotable) John W. Aarsen, U.S. Army Reserve, assistant deputy commander (Troop Program Unit), 94th Training Division, Fort Lee, Virginia, to commander (Troop Program Unit), 451st Sustainment Command (expeditionary), Wichita, Kansas. Col. (Promotable) George N. Appenzeller, command surgeon, U.S. Africa Command, Germany, to deputy commander, Regional Health Command-Pacific, Joint Base Lewis-McChord, Washington. Col. (Promotable) Kris A. Belanger, U.S. Army Reserve, assistant chief of staff, G-7, 80th Training Command (The Army School System), Richmond, Virginia, to commander (Troop Program Unit), 85th U.S. Army Reserve Support Command West, Arlington Heights, Illinois. Col. (Promotable) Douglas A. Cherry, U.S. Army Reserve, chief of staff (Active Guard Reserve), 76th Operational Response Command, Salt Lake City, Utah, to deputy commander (Troop Program Unit), 76th Operational Response Command, Salt Lake City, Utah. Col. (Promotable) Ellen S. Clark, U.S. Army Reserve, division chief (rear) (Individual Mobilization Augmentee), Headquarters, U.S. European Command, Germany, to director, Army Reserve Engagement Cell (Individual Mobilization Augmentee) and deputy commander, United States Army South, Fort Sam Houston, Texas. Col. (Promotable) Robert S. Cooley, Jr., U.S. Army Reserve, deputy commander (Troop Program Unit), 85th Support Command, Arlington Heights, Illinois, to commander (Troop Program Unit), 353d Civil Affairs Command, Staten Island, New York. Col. (Promotable) Dianne M. Del Rosso, U.S. Army Reserve, strategic mobility chief (Individual Mobilization Augmentee), Office of the Deputy Chief of Staff, G-4, Washington, District of Columbia, to commander (Troop Program Unit), 311th Sustainment Command (expeditionary), Los Angeles, California. Col. (Promotable) Joseph A. Edwards II, U.S. Army Reserve, deputy chief of staff, operations (Troop Program Unit), Joint Enabling Capability Command, Norfolk, Virginia, to commander (Troop Program Unit), 104th Training Division (Leader Training), Joint Base Lewis-McChord, Washington. Col. (Promotable) Howard-Charles W. Geck, U.S. Army Reserve, assistant deputy commander-support (Troop Program Unit), 80th Training Command (The Army School System), Richmond, Virginia, to commander (Troop Program Unit), 103d Sustainment Command (expeditionary), Des Moines, Iowa. Col. (Promotable) Michael T. Harvey, U.S. Army Reserve, commander (Active Guard Reserve), U.S. Army Garrison, Fort Buchanan, Puerto Rico, to commander (Troop Program Unit), 102d Training Division (Maneuver Support) and deputy commanding general for mobilization and training (Individual Mobilization Augmentee), U.S. Army Maneuver Support Center, Fort Leonard Wood, Missouri. Col. (Promotable) Martin F. Klein, U.S. Army Reserve, deputy commander (Active Guard Reserve), Joint Base McGuire-Dix-Lakehurst, McGuire Air Force Base, New Jersey, to commander (Troop Program Unit) U.S. Army Reserve Deployment Support Command, Birmingham, Alabama; and deputy commander for mobilization (Troop Program Unit), Military Surface Deployment and Distribution Command, Scott Air Force Base, Illinois. Col. (Promotable) William S. Lynn, U.S. Army Reserve, commander (Troop Program Unit), Southeast Medical Area Regional Support Group, Nashville, Tennessee, to deputy commander (Troop Program Unit), 807th Medical Command (Deployment Support), Salt Lake City, Utah. Col. (Promotable) Joseph A. Marsiglia, U.S. Army Reserve, commander (Troop Program Unit), Central Medical Area Readiness Support Group, Fort Sheridan, Illinois, to mobilization and reserve affairs (Individual Mobilization Augmentee), Office of the Surgeon General, Falls Church, Virginia; and deputy commander (Individual Mobilization Augmentee), Army Reserve Medical Command, Pinellas Park, Florida. Col. (Promotable) Robert F. Pleczkowski, U.S. Army Reserve, director, reserve components integration (Active Guard Reserve), Office of the Chief of Chaplains, Washington, District of Columbia, to assistant deputy chief of chaplains (Individual Mobilization Augmentee), Office of the Chief of Chaplains, Washington, District of Columbia. Col. (Promotable) Mark A. Towne, U.S. Army Reserve, director, chief of Army reserve; and commanding general, U.S. Army Reserve Action Group (Active Guard Reserve), Office of the Chief of Army Reserve, Fort Belvoir, Virginia, to deputy chief of staff (Individual Mobilization Augmentee), Office of the Chief of Army Reserve, Fort Belvoir, Virginia. Col. (Promotable) Irene M. Zoppi, U.S. Army Reserve, commander (Troop Program Unit), U.S. Army Reserve Element, U.S. Southern Command, 76th Operational Response Command, Miami, Florida, to deputy commander-support (Troop Program Unit), 200th Military Police Command (Mission Support Element), Fort Meade, Maryland. Maj. Gen. Thomas W. Geary, assistant deputy chief of staff, intelligence, surveillance and reconnaissance, deputy chief of staff, intelligence, surveillance and reconnaissance, Headquarters U.S. Air Force, Pentagon, Washington, District of Columbia, to military deputy to the director, Defense Intelligence Agency, Washington, District of Columbia. Brig. Gen. Christopher J. Ireland, deputy director, J-5, Headquarters U.S. Special Operations Command, MacDill Air Force Base, Florida, to deputy commander, Canadian North American Aerospace Defense Region and deputy combined/joint force air component commander for 1st Canadian Air Division, North American Aerospace Defense Command, Winnipeg, Manitoba, Canada. Maj. Gen. James R. Marrs, director of intelligence, J-2 (Defense Intelligence Agency), Joint Staff, Pentagon, Washington, District of Columbia, to assistant deputy chief of staff, intelligence, surveillance and reconnaissance, deputy chief of staff, intelligence, surveillance and reconnaissance, Headquarters U.S. Air Force, Pentagon, Washington, District of Columbia. Brig. Gen. (Promotable) Daniel R. Walrath, deputy director for operations, National Joint Operations Intelligence Center, Operations Team Four, J-3, Joint Staff, Washington, District of Columbia, to vice deputy director for nuclear, homeland defense and current operations, J-3, Joint Staff, Washington, District of Columbia. Brig. Gen. (Promotable) Joseph E. Whitlock, U.S. Army Reserve, deputy director, politico-military affairs (Western Hemisphere), Joint Staff, J-5, Washington, District of Columbia, to assistant deputy chief of staff, G3 (Individual Mobilization Augmentee), Office of Deputy Chief of Staff, G-3/5/7, U.S. Army, Washington, District of Columbia. Brig. Gen. Matthew V. Baker, U.S. Army Reserve, to deputy commander (support) (Troop Program Unit), 416th Theater Engineer Command (Mission Support Element), Darien, Illinois. He most recently served as chief of staff (Troop Program Unit), 416th Theater Engineer Command, Darien, Illinois. Brig. Gen. Mark E. Black, U.S. Army Reserve, to deputy commander (Troop Program Unit), 108th Training Command (Initial Entry Training), Charlotte, North Carolina. He most recently served as chief of staff (Troop Program Unit), 108th Training Command (Initial Entry Training), Charlotte, North Carolina. Brig. Gen. Jennifer G. Buckner, deputy commander (operations), Cyber National Mission Force, U.S. Cyber Command, Fort Meade, Maryland, to deputy commander, Joint Task Force-ARES, U.S. Cyber Command, Fort Meade, Maryland. Brig. Gen. Windsor S. Buzza, U.S. Army Reserve, observer controller/trainer (Troop Program Unit), 2d Brigade, Pacific Training Division, 75th Training Command, Denver, Colorado, to deputy commander (Troop Program Unit), 84th Training Command (Leader Readiness), Fort Knox, Kentucky. Brig. Gen. John E. Cardwell, U.S. Army Reserve, commander (Troop Program Unit), 75th Training Command, Houston, Texas, to special assistant to the commander, reserve matters (Individual Mobilization Augmentee), U.S. Northern Command, Peterson Air Force Base, Colorado. Brig. Gen. Telita Crosland to deputy chief of staff for operations, U.S. Army Medical Command, Falls Church, Virginia. She most recently served as commander, Blanchfield Army Community Hospital; and director of health services, U.S. Army Medical Activity, Fort Campbell, Kentucky. Brig. Gen. Lisa L. Doumont, U.S. Army Reserve, mobilization and reserve affairs (Individual Mobilization Augmentee), Office of the Surgeon General, Falls Church, Virginia; and deputy commander (Individual Mobilization Augmentee), Army Reserve Medical Command, Pinellas Park, Florida, to commanding general (Troop Program Unit), Medical Readiness and Training Command, San Antonio, Texas. Brig. Gen. Charles R. Hamilton, commander, Defense Logistics Agency Troop Support, Defense Logistics Agency, Philadelphia, Pennsylvania, to deputy assistant chief of staff, C/J-4, United Nations Command/Combined Forces Command/U.S. Forces Korea, Republic of Korea. Brig. Gen. David W. Ling, U.S. Army Reserve, assistant chief of staff (Individual Mobilization Augmentee), J-4, U.S. Forces Korea, Korea, to commander (Troop Program Unit), Army Reserve Sustainment Command, Birmingham, Alabama. Col. (Promotable) Susan K. Arnold to assistant judge advocate general for military law and operations, U.S. Army, Washington, District of Columbia. She most recently served as staff judge advocate, III Corps, Fort Hood, Texas. Col. (Promotable) Joseph B. Berger III to commander, U.S. Army Legal Services Agency; and chief judge, U.S. Army Court of Criminal Appeals, Fort Belvoir, Virginia. He most recently served as staff judge advocate, U.S. Army Cyber Command, Fort Belvoir, Virginia. Col. (Promotable) Robert P. Huston to commanding general and commandant, U.S. Army Judge Advocate General’s Legal Center and School, Charlottesville, Virginia. He most recently served as staff judge advocate, U.S. Central Command, MacDill Air Force Base, Florida. Brig. Gen. Shaun Q. Morris, who has been selected to the grade of major general, air force program executive officer for weapons and director, Armament Directorate, Air Force Life Cycle Management Center, Air Force Materiel Command, Eglin Air Force Base, Florida, to commander, Air Force Nuclear Weapons Center, Air Force Materiel Command, Kirtland Air Force Base, New Mexico. Brig. Gen. Stephen W. Oliver Jr., who has been selected to the grade of major general, vice commander, U.S. Air Force Expeditionary Center, Air Mobility Command, Joint Base McGuire-Dix-Lakehurst, New Jersey, to assistant deputy Under Secretary of the Air Force (International Affairs), Pentagon, Washington, District of Columbia. Col. Anthony W. Genatempo, who has been selected to the grade of brigadier general, senior materiel leader and F-22 systems program manager, Fighters and Bombers Directorate, Air Force Life Cycle Management Center, Air Force Materiel Command, Wright-Patterson Air Force Base, Ohio, to Air Force program executive officer for weapons and director, Armament Directorate, Air Force Life Cycle Management Center, Air Force Materiel Command, Eglin Air Force Base, Florida. Col. David R. Iverson, who has been selected to the grade of brigadier general, senior military assistant to the Under Secretary of the Air Force, Office of the Under Secretary of the Air Force, Pentagon, Washington, District of Columbia, to senior military assistant to the Secretary of the Air Force, Office of the Secretary of the Air Force, Pentagon, Washington, District of Columbia. Maj. Gen. Scott A. Kindsvater, air deputy/deputy commander operations and intelligence, Combined Joint Task Force-Operation Inherent Resolve, U.S. Central Command; and commander, 9th Air Expeditionary Task Force-Levant, Air Combat Command, Southwest Asia, to deputy chief of staff for operations, Supreme Headquarters Allied Powers Europe, North Atlantic Treaty Organization, Mons, Belgium. Brig. Gen. Vincent K. Becklund, deputy chief, Office of Security Cooperation-Iraq, U.S. Central Command, Baghdad, Iraq, to special assistant to the commander, Headquarters Air Force Special Operations Command, Hurlburt Field, Florida. Brig. Gen. Robert S. Spalding III, senior defense official and defense attaché-China, Defense Intelligence Agency, U.S. Embassy, Beijing, China, to senior director, strategic planning, National Security Council, Executive Office of the President, Washington, District of Columbia. Col. Deanna M. Burt, who has been selected to the grade of brigadier general, from commander, 50th Space Wing, Air Force Space Command, Schriever Air Force Base, Colorado, to vice commander, U.S. Air Force Warfare Center, Air Combat Command, Nellis Air Force Base, Nevada. Maj. Gen. Peter E. Gersten, director, strategic plans, Deputy Chief of Staff for Strategic Plans and Requirements, Headquarters U.S. Air Force, Pentagon, Washington, District of Columbia, to commander, U.S. Air Force Warfare Center, Air Combat Command, Nellis Air Force Base, Nevada. Maj. Gen. Brian M. Killough, director of strategy, concepts and assessments, Deputy Chief of Staff for Strategic Plans and Requirements, Headquarters U.S. Air Force, Pentagon, Washington, District of Columbia, to director, strategic plans, Deputy Chief of Staff for Strategic Plans and Requirements, Headquarters U.S. Air Force, Pentagon, Washington, District of Columbia. Maj. Gen. Glen D. VanHerck, commander, U.S. Air Force Warfare Center, Air Combat Command, Nellis Air Force Base, Nevada, to vice director, J-5, Joint Staff, Pentagon, Washington, District of Columbia. Maj. Gen. Sarah E. Zabel, vice director, Defense Information Systems Agency, Fort George G. Meade, Maryland, to director, information technology acquisition process development, Office of the Assistant Secretary of the Air Force for Acquisition, Joint Base Anacostia-Bolling, District of Columbia. Brig. Gen. David W. Hicks, commanding general, Train, Advise, Assist Command-Air; and commander, 438th Air Expeditionary Wing, Air Combat Command, Kabul, Afghanistan, to director of strategy, concepts and assessments, Deputy Chief of Staff for Strategic Plans and Requirements, Headquarters U.S. Air Force, Pentagon, Washington, District of Columbia. Brig. Gen. John T. Rauch Jr., who has been selected to the grade of major general, from director, future warfare, Deputy Chief of Staff, Intelligence, Surveillance and Reconnaissance, Headquarters U.S. Air Force, Pentagon, Washington, District of Columbia, to chief of safety, Headquarters U.S. Air Force, Pentagon, Washington, District of Columbia; and commander, Air Force Safety Center, Kirtland Air Force Base, New Mexico. Col. Michael L. Downs, who has been selected to the grade of brigadier general, from commander, 17th Training Wing, Air Education and Training Command, Goodfellow Air Force Base, Texas, to director, future warfare, Deputy Chief of Staff, Intelligence, Surveillance and Reconnaissance, Headquarters U.S. Air Force, Pentagon, Washington, District of Columbia. Maj. Gen. Robert D. Carlson, Army Reserve, deputy chief of engineers, Reserve Affairs (Individual Mobilization Augmentee), Army Corps of Engineers, Washington, District of Columbia; and commanding general, Transatlantic Division, Army Corps of Engineers, Winchester, Virginia, to special assistant to the Assistant Secretary of the Army (Manpower and Reserve Affairs) (Individual Mobilization Augmentee), Office of the Assistant Secretary of the Army (Manpower and Reserve Affairs), Washington, District of Columbia. Maj. Gen. Steven R. Grove, director, Army Quadrennial Defense Review Office, Office of the Deputy Chief of Staff, G-8, Army, Washington, District of Columbia, to deputy director, Joint Improvised-Threat Defeat Organization, Defense Threat Reduction Agency, Fort Belvoir, Virginia. Maj. Gen. A.C. Roper Jr., Army Reserve, commanding general (Troop Program Unit), 80th training command (Total Army School System), Richmond, Virginia, to commanding general (Troop Program Unit), 76th Army Operational Response Command, Salt Lake City, Utah. Brig. Gen. Charles H. Cleveland, most recently serving as deputy chief of staff, communications, Resolute Support Mission, North Atlantic Treaty Organization, Operation Freedom’s Sentinel, Afghanistan, to vice director for Intelligence, J-2, Joint Staff (Defense Intelligence Agency), Washington, District of Columbia. Brig. Gen. Steven T. Eveker, Army Reserve, commander (Troop Program Unit), Army Reserve Deployment Support Command, Birmingham, Alabama; and deputy commander for mobilization (Individual Mobilization Augmentee), Military Surface Deployment and Distribution Command, Scott Air Force Base, Illinois, to deputy commander (Troop Program Unit), 377th Theater Sustainment Command, New Orleans, Louisiana. Brig. Gen. Patrick D. Frank, deputy commanding general, 1st Infantry Division, Fort Riley, Kansas, to deputy commanding general, Army Cadet Command, Fort Knox, Kentucky. Brig. Gen. Johnnie L. Johnson Jr., deputy commanding general (Maneuver), 2nd Infantry Division (Combined), Eighth Army, Republic of Korea, to deputy director, program analysis and evaluation, Office of the Deputy Chief of Staff, G-8, Army, Washington, District of Columbia. Brig. Gen. Mary-Kate Leahy, Army Reserve, director, J-2, Southern Command, Doral, Florida, to director, Army Reserve Engagement Cell (Individual Mobilization Augmentee); and deputy commanding general, Mobilization and Reserve Affairs (Individual Mobilization Augmentee), U.S. Army Europe, Germany. Brig. Gen. Eugene J. LeBoeuf, Army Reserve, deputy commanding general (Individual Mobilization Augmentee), Vice Provost for Academic Affairs, The Army University, Fort Leavenworth, Kansas, to director, Army Reserve Engagement Cell; and deputy commander (Individual Mobilization Augmentee), U.S. Army, Africa, Italy. Brig. Gen. Jonathan J. McColumn, Army Reserve, commander (Troop Program Unit), 103d Sustainment Command (Expeditionary), Des Moines, Iowa, to chief of sustainment, Army Central, Shaw Air Force Base, South Carolina. Brig. Gen. John H. Phillips, Army Reserve, deputy commanding general-cyber (Troop Program Unit), 335th Signal Command (Theater), East Point, Georgia, to commanding general (Troop Program Unit), 335th Signal Command (Theater), Operational Command Post (Forward), Kuwait. Brig. Gen. Patrick B. Roberson, assistant commanding general-operations, 1st Special Forces Command (Airborne); and deputy commander, Special Operations Joint Task Force-Operation Inherent Resolve, Iraq, to deputy chief of staff, G-3/5/7, Army Reserve Command, Fort Bragg, North Carolina. Maj. Gen. Joseph T. Guastella Jr., deputy chief of staff for operations, Supreme Headquarters Allied Powers Europe, North Atlantic Treaty Organization, Mons, Belgium, to director of integrated air, space, cyberspace and intelligence, surveillance and reconnaissance operations, Headquarters Air Force Space Command, Peterson Air Force Base, Colorado. Brig. Gen. Barry R. Cornish, commander, 18th Wing, Pacific Air Forces, Kadena Air Base, Japan, to deputy director, Operations Team One, National Joint Operations and Intelligence Center, J-3, Joint Staff, Pentagon, Washington, District Of Columbia. Col. Case A. Cunningham, who has been selected to the grade of brigadier general, from commander, 432nd Wing and 432nd Air Expeditionary Wing, Air Combat Command, Creech Air Force Base, Nevada, to commander, 18th Wing, Pacific Air Forces, Kadena Air Base, Japan. Brig. Gen. Eric T. Hill, deputy director, strategy, plans and policy, J-5, Headquarters Special Operations Command, MacDill Air Force Base, Florida, to deputy director, plans and policy, J-5, Headquarters, U.S. Central Command, MacDill Air Force Base, Florida. Brig. Gen. Billy D. Thompson, director, regional affairs, Office of the Deputy Under Secretary of the Air Force, International Affairs, Office of the Under Secretary of the Air Force, Pentagon, Washington, District of Columbia, to commander, Jeanne M. Holm Center for Officer Accessions and Citizen Development, Air Education and Training Command, Maxwell Air Force Base, Alabama. Col. Richard H. Boutwell, who has been selected to the grade of brigadier general, from executive assistant to the commander, U.S. Northern Command, Peterson Air Force Base, Colorado, to director, regional affairs, Office of the Deputy Under Secretary of the Air Force, International Affairs, Office of the Under Secretary of the Air Force, Pentagon, Washington, District of Columbia. Brig. Gen. Alexus G. Grynkewich, deputy director, operations, Operations Team Three, National Joint Operations and Intelligence Center, J-3, Joint Staff, Pentagon, Washington, District of Columbia, to deputy director, Global Operations, J-3, Joint Staff, Pentagon, Washington, District of Columbia. Brig. Gen. Darren V. James, commander, 379th Air Expeditionary Wing, Air Combat Command, Al Udeid, Qatar, to vice commander, Eighteenth Air Force, Air Mobility Command, Scott Air Force Base, Illinois. Brig. Gen. William M. Knight, deputy director, operations, Operations Team Two, National Joint Operations and Intelligence Center, J-3, Joint Staff, Pentagon, Washington, District of Columbia, to vice commander, U.S. Air Force Expeditionary Center, Air Mobility Command, Joint Base McGuire-Dix-Lakehurst, New Jersey. Brig. Gen. James D. Peccia III, director, budget operations and personnel, Office of the Assistant Secretary for Financial Management and Comptroller, Pentagon, Washington, District of Columbia, to director, financial management, Headquarters Air Force Materiel Command, Wright-Patterson Air Force Base, Ohio. Brig. Gen. John M. Pletcher, who has been selected to the grade of major general, from director, financial management, Headquarters Air Force Materiel Command, Wright-Patterson Air Force Base, Ohio, to deputy assistant secretary for budget, Office of the Assistant Secretary of the Air Force for Financial Management and Comptroller, Pentagon, Washington, District of Columbia. Col. Albert G. Miller, who has been selected to the grade of brigadier general, from commander, 22d Air Refueling Wing, Air Mobility Command, McConnell Air Force Base, Kansas, to director, U.S. Central Command Deployment and Distribution Operations Center, U.S. Central Command, Southwest Asia. Maj. Gen. Scott D. Berrier, commanding general and commandant, U.S. Army Intelligence Center of Excellence and Fort Huachuca, Fort Huachuca, Arizona, to military deputy to the director, Defense Intelligence Agency, Washington, District of Columbia. Maj. Gen. Willard M. Burleson III, senior advisor to the Ministry of Defense, U.S. Forces-Afghanistan, Operation Freedom’s Sentinel, Afghanistan, to commanding general, 7th Infantry Division, Joint Base Lewis-McChord, Washington. Maj. Gen. John S. Kem, deputy commandant, U.S. Army Command and General Staff College; and deputy commanding general-education, U.S. Army Combined Arms Center, Fort Leavenworth, Kansas, to commandant, U.S. Army War College, Carlisle Barracks, Pennsylvania. Maj. Gen. James B. Linder, commanding general, U.S. Army John F. Kennedy Special Warfare Center and School, Fort Bragg, North Carolina, to commander, Special Operations Joint Task Force-Afghanistan and Special Operations Component Command-Afghanistan, Resolute Support Mission, U.S. Forces-Afghanistan, Operation Freedom’s Sentinel, Afghanistan. Maj. Gen. Christopher P. McPadden, deputy director, strategy and policy, J-5, Joint Staff, Washington, District of Columbia, to director, strategy, plans and policy, Office of the Deputy Chief of Staff, G-3/5/7, U.S. Army, Washington, District of Columbia. Brig. Gen. (Promotable) Daniel G. Mitchell, director, G-3/5/7, Installation Management Command, Joint Base San Antonio, Texas, to deputy chief of staff for logistics and operations, U.S. Army Materiel Command, Redstone Arsenal, Alabama. Brig. Gen. Robert W. Bennett Jr., deputy commanding general, U.S. Army Cadet Command, Fort Knox, Kentucky, to the adjutant general of the U.S. Army, U.S. Army Human Resources Command; commanding general, U.S. Army Physical Disability Agency; and executive director, Military Postal Service Agency, Fort Knox, Kentucky. Brig. Gen. Xavier T. Brunson, deputy commanding general (operations), 10th Mountain Division (Light), Fort Drum, New York, to chief of staff, XVIII Airborne Corps, Fort Bragg, North Carolina. Brig. Gen. Edwin J. Deedrick Jr., deputy commanding general, 1st Special Forces Command (Airborne), Fort Bragg, North Carolina, to assistant commander-support, Joint Special Operations Command, U.S. Special Operations Command, Fort Bragg, North Carolina. Brig. Gen. Christopher T. Donahue, deputy commanding general (maneuver), 4th Infantry Division, Fort Carson, Colorado, to commandant, U.S. Army Infantry School, U.S. Army Maneuver Center of Excellence, Fort Benning, Georgia. Brig. Gen. Scott L. Efflandt, deputy commanding general (maneuver), 1st Infantry Division, Fort Riley, Kansas, to deputy commandant, U.S. Army Command and General Staff College; and deputy commanding general-education, U.S. Army Combined Arms Center, Fort Leavenworth, Kansas. Brig. Gen. Antonio M. Fletcher, assistant commanding general-support, 1st Special Forces Command (Airborne), Fort Bragg, North Carolina, to director, J-5, U.S. Southern Command, Doral, Florida. Brig. Gen. David J. Francis, deputy commanding general (support), 2d Infantry Division (Combined), Eighth Army, Republic of Korea, to commanding general, U.S. Army Combat Readiness Center; and director of Army Safety, Fort Rucker, Alabama. Brig. Gen. Bradley T. Gericke, deputy director, strategy, plans and policy, J-5, U.S. Central Command, MacDill Air Force Base, Florida, to deputy director, strategy and policy, J-5, Joint Staff, Washington, District of Columbia. Brig. Gen. Karen H. Gibson, director, CJ2, Combined Joint Task Force-Operation Inherent Resolve, Operation Inherent Resolve, Kuwait, to director, J-2, U.S. Central Command, MacDill Air Force Base, Florida. Brig. Gen. Karl H. Gingrich, assistant program executive officer for operations, readiness, and fielding, Office of the Program Executive Officer, Command, Control and Communication (Tactical), Aberdeen Proving Ground, Maryland, to director, capability and resource integration, J-8, U.S. Cyber Command, Fort Meade, Maryland. Brig. Gen. Viet X. Luong, chief of staff, U.S. Army Central, Shaw Air Force Base, South Carolina, to deputy commanding general (operations), Eighth Army, Republic of Korea. Brig. Gen. Brian J. Mennes, director, joint and integration, Office of the Deputy Chief of Staff, G-8, U.S. Army, Washington, District of Columbia, to director, force management, Office of the Deputy Chief of Staff, G-3/5/7, U.S. Army, Washington, District of Columbia. Brig. Gen. John E. Novalis II, deputy commanding general (support), 101st Airborne Division (Air Assault), Fort Campbell, Kentucky, to deputy chief of staff operations, Multinational Corps Northeast, North Atlantic Treaty Organization, Poland. Brig. Gen. Joseph W. Rank, senior defense official and defense attaché-United Arab Emirates (U.S. Central Command), Defense Intelligence Agency, United Arab Emirates, to principal director to the Deputy Assistant Secretary of Defense for Middle East Policy, Office of the Secretary of Defense, Washington, District of Columbia. Brig. Gen. Michel M. Russell, Sr., deputy assistant chief of staff, C/J-4, United Nations Command/Combined Forces Command/U.S. Forces Korea, Republic of Korea, to commanding general, 19th Sustainment Command (Expeditionary), Eighth Army, Republic of Korea. Brig. Gen. Douglas A. Sims II, deputy commanding general (support), 1st Cavalry Division, Fort Hood, Texas, to director, operations, readiness and mobilization, Office of the Deputy Chief of Staff, G-3/5/7, U.S. Army, Washington, District of Columbia. Brig. Gen. Stephen G. Smith, director, CJ3, Combined Joint Task Force-Operation Inherent Resolve, Operation Inherent Resolve, Kuwait, to deputy commanding general (support),1st Infantry Division, Fort Riley, Kansas. Brig. Gen. Ronald T. Stephens, deputy commanding general, Regional Health Command-Pacific, Joint Base Lewis-McChord, Washington, to deputy chief of staff for support, U.S. Army Medical Command, Falls Church, Virginia. Brig. Gen. John P. Sullivan, commanding general, 19th Sustainment Command (Expeditionary), Eighth Army, Republic of Korea, to assistant deputy chief of staff, G-4, U.S. Army, Washington, District of Columbia. Brig. Gen. Steven J. Bleymaier, commander, Ogden Air Logistics Complex, Air Force Materiel Command, Hill Air Force Base, Utah, to director, logistics, engineering and force protection, Headquarters Air Mobility Command, Scott Air Force Base, Illinois. Brig. Gen. Charles S. Corcoran, commander, 380th Air Expeditionary Wing, Air Combat Command, Southwest Asia, to deputy chief of staff, operations, Headquarters Allied Air Command, Allied Command Operations, North Atlantic Treaty Organization, Ramstein Air Base, Germany. Brig. Gen. Stacey T. Hawkins, director, logistics, engineering and force protection, Headquarters Air Mobility Command, Scott Air Force Base, Illinois, to commander, Ogden Air Logistics Complex, Air Force Materiel Command, Hill Air Force Base, Utah. Brig. Gen. Kevin A. Huyck, deputy chief of staff, operations, Headquarters Allied Air Command, Allied Command Operations, North Atlantic Treaty Organization, Ramstein Air Base, Germany, to deputy director, operations (protection), Headquarters U.S. Northern Command, Peterson Air Force Base, Colorado. Brig. Gen. Robert J. Skinner, who has been selected to the grade of major general, from deputy commander, Joint Force Headquarters Department of Defense Information Networks, Defense Information Systems Agency, Fort George G. Meade, Maryland, to vice commander, Headquarters Air Force Space Command, Peterson Air Force Base, Colorado. Col. Derek C. France, who has been selected to the grade of brigadier general, from senior executive officer to the vice chief of staff of the Air Force, Headquarters U.S. Air Force, Pentagon, Washington, District of Columbia, to commander, 380th Air Expeditionary Wing, Air Combat Command, Southwest Asia. Maj. Gen. Nina M. Armagno, director, strategic plans, programs, requirements and analysis, Headquarters Air Force Space Command, Peterson Air Force Base, Colorado, to director, plans and policy, J-5, Headquarters U.S. Strategic Command, Offutt Air Force Base, Nebraska. Maj. Gen. Clinton E. Crosier, director, plans and policy, J-5, Headquarters U.S. Strategic Command, Offutt Air Force Base, Nebraska, to director, operational capability requirements, Deputy Chief of Staff for Strategic Plans, Programs and Requirements, Headquarters U.S. Air Force, Pentagon, Washington, District of Columbia. Maj. Gen. Charles L. Moore, deputy director for global operations, J-3, Joint Staff, Pentagon, Washington, District of Columbia, to director, operations, J-3, Headquarters U.S. Cyber Command, Fort George G. Meade, Maryland. Brig. Gen. Christopher A. Coffelt, commander, Spaatz Center for Officer Education and Commandant, Air War College, Air University, Air Education and Training Command, Maxwell Air Force Base, Alabama, to deputy director, nuclear operations, Global Operations Directorate, Headquarters U.S. Strategic Command, Offutt Air Force Base, Nebraska. Brig. Gen. Andrew J. Gebara, deputy director, nuclear operations, Global Operations Directorate, Headquarters U.S. Strategic Command, Offutt Air Force Base, Nebraska, to vice deputy director for nuclear, homeland defense and current operations, J-3, Joint Staff, Pentagon, Washington, District of Columbia. Brig. Gen. John E. Shaw, deputy director, global operations, J-3, Headquarters U.S. Strategic Command, Offutt Air Force Base, Nebraska, to director, strategic plans, programs, requirements and analysis, Headquarters Air Force Space Command, Peterson Air Force Base, Colorado. Col. Michael G. Koscheski, who has been selected to the grade of brigadier general, from chief, Strategic Planning Integration Division, Deputy Chief of Staff for Strategic Plans, Programs and Requirements, Headquarters U.S. Air Force, Pentagon, Washington, District of Columbia, to deputy commander, Canadian North American Aerospace Defense Region; and deputy combined/joint force air component commander for 1st Canadian Air Division, North American Aerospace Defense Command, Winnipeg, Manitoba, Canada. Col. Jeremy T. Sloane, who has been selected to the grade of brigadier general, from vice director, operations, J-3, Headquarters North American Aerospace Defense Command, Peterson Air Force Base, Colorado, to commander, Spaatz Center for Officer Education and Commandant, Air War College, Air University, Air Education and Training Command, Maxwell Air Force Base, Alabama. Col. Phillip A. Stewart, who has been selected to the grade of brigadier general, from deputy director of operations, Headquarters U.S. Air Forces in Europe, Ramstein Air Base, Germany, to commanding general, Train, Advise, Assist Command-Air; and commander, 438th Air Expeditionary Wing, Air Combat Command, Kabul, Afghanistan. Maj. Gen. Anthony C. Funkhouser, commanding general, U.S. Army Center for Initial Military Training, U.S. Army Training and Doctrine Command, Joint Base Langley-Eustis, Virginia, to deputy commanding general for military and international operations, U.S. Army Corps of Engineers, Washington, District of Columbia. Maj. Gen. Richard G. Kaiser, commander, Combined Security Transition Command-Afghanistan, U.S. Forces-Afghanistan, Operation Freedom’s Sentinel, Afghanistan, to commanding general, Mississippi Valley Division, U.S. Army Corps of Engineers, Vicksburg, Mississippi. Maj. Gen. Michael C. Wehr, commanding general, Mississippi Valley Division, U.S. Army Corps of Engineers, Vicksburg, Mississippi, to deputy chief of engineers and deputy commanding general, U.S. Army Corps of Engineers, Washington, District of Columbia. Brig. Gen. Peter B. Andrysiak, Jr., commanding general, Pacific Ocean Division, U.S. Army Corps of Engineers, Fort Shafter, Hawaii, to deputy commanding general, 25th Infantry Division, Schofield Barracks, Hawaii. Brig. Gen. Robin L. Fontes, deputy director, strategy, plans and policy, Office of the Deputy Chief of Staff, G-3/5/7, U.S. Army, Washington, District of Columbia, to commander, Combined Security Transition Command-Afghanistan, U.S. Forces-Afghanistan, Operation Freedom’s Sentinel, Afghanistan. Brig. Gen. David C. Hill, commanding general, Southwestern Division, U.S. Army Corps of Engineers, Dallas, Texas, to commanding general, Transatlantic Division, U.S. Army Corps of Engineers, Winchester, Virginia. Brig. Gen. Diana M. Holland, commandant of cadets, U.S. Military Academy, West Point, New York, to commanding general, South Atlantic Division, U.S. Army Corps of Engineers, Atlanta, Georgia. Brig. Gen. James H. Raymer, commandant, U.S. Army Engineer School, U.S. Army Maneuver Support Center of Excellence, Fort Leonard Wood, Missouri, to chief of staff, U.S. Army Central, Shaw Air Force Base, South Carolina. Brig. Gen. Robert F. Whittle Jr., deputy commanding general, 1st Cavalry Division, Fort Hood, Texas, to commandant, U.S. Army Engineer School, U.S. Army Maneuver Support Center of Excellence, Fort Leonard Wood, Missouri. Maj. Gen. Michael A. Fantini, principal director to the deputy assistant secretary of defense for Middle East policy, Office of the Under Secretary of Defense for Policy, Office of the Secretary of Defense, Pentagon, Washington, District of Columbia, to director, global power programs, Office of the Assistant Secretary of the Air Force for Acquisition, Pentagon, Washington, District of Columbia. Maj. Gen. Jon A. Norman, director, global power programs, Office of the Assistant Secretary of the Air Force for Acquisition, Pentagon, Washington, District of Columbia, to chief of staff, Headquarters U.S. Southern Command, Miami, Florida. Brig. Gen. Sam C. Barrett, commander, Joint Enabling Capabilities Command, U.S. Transportation Command, Norfolk, Virginia, to director, operations, Strategic Deterrence and Nuclear Integration, Headquarters Air Mobility Command, Scott Air Force Base, Illinois. Brig. Gen. Timothy D. Haugh, deputy commander, Joint Task Force ARES, Headquarters U.S. Cyber Command, Fort George G. Meade, Maryland, to director of intelligence, Headquarters U.S. Cyber Command, Fort George G. Meade, Maryland. Brig. Gen. William M. Knight, deputy director, operations, Operations Team Two, National Joint Operations and Intelligence Center, J-3, Joint Staff, Pentagon, Washington, District of Columbia, to vice commander, 18th Air Force, Air Mobility Command, Scott Air Force Base, Illinois. Brig. Gen. Mary F. O’Brien, who has been selected to the grade of major general, from director of intelligence, Headquarters U.S. Cyber Command, Fort George G. Meade, Maryland, to commander, 25th Air Force, Air Combat Command, Joint Base San Antonio-Lackland, Texas. Brig. Gen. Brian S. Robinson, who has been selected to the grade of major general, from director, operations, Strategic Deterrence and Nuclear Integration, Headquarters Air Mobility Command, Scott Air Force Base, Illinois, to assistant deputy chief of staff, operations, Headquarters U.S. Air Force, Pentagon, Washington, District of Columbia. Brig. Gen. Lenny J. Richoux, vice commander, 18th Air Force, Air Mobility Command, Scott Air Force Base, Illinois, to commander, Joint Enabling Capabilities Command, U.S. Transportation Command, Norfolk, Virginia. Brig. Gen. Daniel L. Simpson, deputy director of intelligence, U.S. Forces Afghanistan; and assistant deputy chief of staff of intelligence to North Atlantic Treaty Organization Headquarters Resolute Support, U.S. Central Command, Kabul, Afghanistan, to director, intelligence and information, North American Aerospace Defense Command and Headquarters U.S. Northern Command, Peterson Air Force Base, Colorado. Brig. Gen. Brad M. Sullivan, director, intelligence and information, North American Aerospace Defense Command and Headquarters U.S. Northern Command, Peterson Air Force Base, Colorado, to deputy director, operations, Operations Team Two, National Joint Operations and Intelligence Center, J-3, Joint Staff, Pentagon, Washington, District of Columbia. Maj. Gen. Thomas H. Deale, director of operations, Headquarters Air Combat Command, Joint Base Langley-Eustis, Virginia, to vice director, J-7, Joint Force Development, Joint Staff, Suffolk, Virginia. Maj. Gen. Donald E. Kirkland, director, logistics, Civil Engineering and Force Protection, Headquarters Air Force Materiel Command, Wright-Patterson Air Force Base, Ohio, to director, logistics, Deputy Chief of Staff for Logistics, Engineering, and Force Protection, Headquarters U.S. Air Force, Pentagon, Washington, District of Columbia. Brig. Gen. Allan E. Day, commander, Defense Logistics Agency-Aviation, Richmond, Virginia, to director, logistics, Civil Engineering and Force Protection, Headquarters Air Force Materiel Command, Wright-Patterson Air Force Base, Ohio. Brig. Gen. Eric T. Fick, director, Global Reach Programs, Office of the Assistant Secretary of the Air Force (Acquisition), Pentagon, Washington, District of Columbia, to deputy director, Joint Strike Fighter Program, Under Secretary of Defense (Acquisition, Technology and Logistics), Pentagon, Washington, District of Columbia. Brig. Gen. Linda S. Hurry, director, Expeditionary Support, Air Force Installation and Mission Support Center, Air Force Materiel Command, Joint Base San Antonio-Lackland, Texas, to commander, Defense Logistics Agency-Aviation, Richmond, Virginia. Brig. Gen. James A. Jacobson, who has been selected to the grade of major general, from inspector general, Headquarters Air Mobility Command, Scott Air Force Base, Illinois, to commander, Air Force District of Washington, Joint Base Andrews, Maryland. Brig. Gen. Brian T. Kelly, who has been selected to the grade of major general, from director, Military Force Management Policy, Deputy Chief of Staff, Manpower, Personnel and Services, Headquarters U.S. Air Force, Pentagon, Washington, District of Columbia, to commander, Air Force Personnel Center, Deputy Chief of Staff, Manpower, Personnel and Services, Joint Base San Antonio-Randolph, Texas. Brig. Gen. Duke Z. Richardson, who has been selected to the grade of major general, from program executive officer, Tankers, Office of the Assistant Secretary of the Air Force (Acquisition), Wright-Patterson Air Force Base, Ohio, to program executive officer, Presidential Airlift Recapitalization, Office of the Assistant Secretary of the Air Force (Acquisition), Wright-Patterson Air Force Base, Ohio. Brig. Gen. James R. Sears Jr., commander, 455th Air Expeditionary Wing, Air Combat Command, Bagram Airfield, Afghanistan, to director, Intelligence, Operations, and Nuclear Integration, Headquarters Air Education and Training Command, Joint Base San Antonio-Randolph, Texas. Brig. Gen. Jon T. Thomas, who has been selected to the grade of major general, from director, Strategic Plans, Requirements and Programs, Headquarters Air Mobility Command, Scott Air Force Base, Illinois, to director, Operations, Strategic Deterrence, and Nuclear Integration, Headquarters U.S. Air Forces in Europe, Ramstein Air Base, Germany. Brig. Gen. John M. Wood, who has been selected to the grade of major general, from deputy director, Politico-Military Affairs (Europe, North Atlantic Treaty Organization, Russia), J-5, Joint Staff, Pentagon, Washington, District of Columbia, to director, Strategic Plans, Requirements and Programs, Headquarters Air Mobility Command, Scott Air Force Base, Illinois. Col. Dagvin R.M. Anderson, who has been selected to the grade of brigadier general, from special assistant to the commander, United Nations Command and Combined Forces Command, U.S. Forces Korea, Yongsan Army Garrison, Republic of Korea, to deputy director of operations, J-3, Headquarters U.S. Pacific Command, Camp H. M. Smith, Hawaii. Col. Jason R. Armagost, who has been selected to the grade of brigadier general, from deputy director, Current Operation, J-3, Headquarters U.S. Strategic Command, Offutt Air Force Base, Nebraska, to commander, 379th Air Expeditionary Wing, Air Combat Command, Al Udeid Air Base, Qatar. Col. Craig R. Baker, who has been selected to the grade of brigadier general, from chief, Checkmate Division, Deputy Chief of Staff, Operations, Headquarters U.S. Air Force, Pentagon, Washington, District of Columbia, to commander, 455th Air Expeditionary Wing, Air Combat Command, Bagram Airfield, Afghanistan. Col. Ryan L. Britton, who has been selected to the grade of brigadier general, from deputy director for acquisition, Missile Defense Agency, Fort Belvoir, Virginia, to director, Global Reach Programs, Office of the Assistant Secretary of the Air Force (Acquisition), Pentagon, Washington, District of Columbia. Col. Evan C. Dertien, who has been selected to the grade of brigadier general, from vice commander, Air Force Research Laboratory, Air Force Materiel Command, Wright-Patterson Air Force Base, Ohio, to commander, 96th Test Wing, Air Force Materiel Command, Eglin Air Force Base, Florida. Col. David M. Gaedecke, who has been selected to the grade of brigadier general, from commander, 552d Air Control Wing, Air Combat Command, Tinker Air Force Base, Oklahoma, to director, Cyberspace Operations and Warfighting Integration, Office of Information Dominance and Chief Information Officer, Office of the Secretary of the Air Force, Pentagon, Washington, District of Columbia. Col. Philip A. Garrant, who has been selected to the grade of brigadier general, from senior materiel leader, Space Superiority Directorate, Space and Missile Systems Center, Air Force Space Command, Los Angeles Air Force Base, California, to vice commander, Space and Missile Systems Center, Air Force Space Command, Los Angeles Air Force Base, California. Col. Kristin E. Goodwin, who has been selected to the grade of brigadier general, from senior military assistant to the Secretary of the Air Force, Office of the Secretary of the Air Force, Pentagon, Washington, District of Columbia, to commandant of cadets, U.S. Air Force Academy, Colorado Springs, Colorado. Col. Ronald E. Jolly Sr., who has been selected to the grade of brigadier general, from deputy director of resource integration, Deputy Chief of Staff for Logistics, Engineering, and Force Protection, Headquarters U.S. Air Force, Pentagon, Washington, District of Columbia, to commander, 82nd Training Wing, Air Education and Training Command, Sheppard Air Force Base, Texas. Col. Leah G. Lauderback, who has been selected to the grade of brigadier general, from senior military assistant to the Under Secretary of Defense for Intelligence, Office of the Secretary of Defense, Pentagon, Washington, District of Columbia, to director, CJ2, Combined Joint Task Force-Operation Inherent Resolve, Southwest Asia. Col. John J. Nichols, who has been selected to the grade of brigadier general, from deputy director of operations, Headquarters Air Force Global Strike Command, Barksdale Air Force Base, Louisiana, to commander, 509th Bomb Wing, Air Force Global Strike Command, Whiteman Air Force Base, Missouri. Col. Robert G. Novotny, who has been selected to the grade of brigadier general, from director, Air Force Colonel Management Office, Deputy Chief of Staff, Manpower, Personnel and Services, Headquarters U.S. Air Force, Pentagon, Washington, District of Columbia, to deputy director, Plans and Programs, Headquarters Air Combat Command, Joint Base Langley-Eustis, Virginia. Col. Lance R. Pilch, who has been selected to the grade of brigadier general, from commander, 33rd Fighter Wing, Air Education and Training Command, Eglin Air Force Base, Florida, to vice commander, 7th Air Force, Pacific Air Forces and Chief of Staff, Air Component Command, Osan Air Base, Republic of Korea. Col. Donna D. Shipton, who has been selected to the grade of brigadier general, from senior military assistant to the Assistant Secretary of the Air Force (Acquisition), Pentagon, Washington, District of Columbia, to program executive officer, Tankers, Office of the Assistant Secretary of the Air Force (Acquisition), Wright-Patterson Air Force Base, Ohio. Maj. Gen. Scottie D. Carpenter, U.S. Army Reserve, commander (Troop Program Unit), 84th Training Command, Fort Knox, Kentucky, to deputy commanding general (operations) (individual mobilization augmentee), U.S. Army Reserve Command; and deputy commanding general, U.S. Army Reserve, U.S. Army Forces Command, Fort Bragg, North Carolina. Maj. Gen. Jason T. Evans, director, military personnel management, Office of the Deputy Chief of Staff, G-1, U.S. Army, Washington, District of Columbia, to commanding general, U.S. Army Human Resources Command, Fort Knox, Kentucky. Maj. Gen. Malcolm B. Frost, chief of public affairs, Office of the Secretary of the Army, Washington, District of Columbia, to commanding general, U.S. Army Center for Initial Military Training, U.S. Army Training and Doctrine Command, Joint Base Langley-Eustis, Virginia. Maj. Gen. Duane A. Gamble, commanding general, 21st Theater Sustainment Command, U.S. Army Europe, Germany, to commanding general, U.S. Army Sustainment Command, Rock Island, Illinois. Maj. Gen. William B. Hickman, deputy commanding general, U.S. Army Central, Kuwait, to deputy chief of staff, strategic plans and policy, Headquarters, Supreme Allied Command-Transformation, Norfolk, Virginia. Maj. Gen. Clayton M. Hutmacher, deputy commanding general, U.S. Army Special Operations Command, Fort Bragg, North Carolina, to director of operations, J-3, U.S. Special Operations Command, MacDill Air Force Base, Florida. Maj. Gen. James E. Kraft Jr., commanding general, 1st Special Forces Command (Airborne), Fort Bragg, North Carolina, to deputy commanding general, U.S. Army Special Operations Command, Fort Bragg, North Carolina. Maj. Gen. Mark J. O’Neil, chief of staff, U.S. Army Pacific, Fort Shafter, Hawaii, to commanding general, U.S. Army Alaska; and deputy commander, U.S. Alaskan Command, Joint Base Elmendorf-Richardson, Alaska. Maj. Gen. Steven A. Shapiro, deputy chief of staff for logistics and operations, U.S. Army Materiel Command, Redstone Arsenal, Alabama, to commanding general, 21st Theater Sustainment Command, U.S. Army Europe, Germany. Maj. Gen. Wilson A. Shoffner Jr., director, Talent Management Task Force, Office of the Deputy Chief of Staff, G-1, U.S. Army, Washington, District of Columbia, to director of operations; and director, Rapid Equipment Fielding, Army Rapid Capabilities Office, Office of the Assistant Secretary of the Army (Acquisition, Logistics and Technology), Washington, District of Columbia. Maj. Gen. Mark R. Stammer, deputy commanding general, I Corps, Joint Base Lewis-McChord, Washington, to commanding general, U.S. Army South, Joint Base San Antonio, Texas. Maj. Gen. Randy S. Taylor, director of architecture, operations, networks and space, Office of the Chief Information Officer, G-6, U.S. Army, Washington, District of Columbia, to commanding general, U.S. Army Communications-Electronics Command and Aberdeen Proving Ground, Aberdeen Proving Ground, Maryland. Maj. Gen. Tracy A. Thompson, U.S. Army Reserve, commander (Troop Program Unit), 412th Theater Engineer Command, Vicksburg, Mississippi, to deputy commanding general (support) (individual mobilization augmentee), U.S. Army Reserve Command, Fort Bragg, North Carolina; and deputy commanding general (individual mobilization augmentee), U.S. Army Reserve, U.S. Army Training and Doctrine Command, Joint Base Langley-Eustis, Virginia. Maj. Gen. Robert P. Walters Jr., deputy chief of staff, intelligence, Resolute Support Mission, North Atlantic Treaty Organization; and director, J-2, U.S. Forces-Afghanistan, Operation Freedom’s Sentinel, Afghanistan, to commanding general and commandant, U.S. Army Intelligence Center of Excellence and Fort Huachuca, Fort Huachuca, Arizona. Brig. Gen. Carl A. Alex, assistant chief of staff, G-3, U.S. Army Central, Shaw Air Force Base, South Carolina, to deputy chief of staff operations, Headquarters Allied Joint Force Command-Brunssum, North Atlantic Treaty Organization, Netherlands. Brig. Gen. Francis M. Beaudette, assistant commander-support, Joint Special Operations Command, U.S. Special Operations Command, Fort Bragg, North Carolina, to commanding general, 1st Special Forces Command (Airborne), Fort Bragg, North Carolina. Brig. Gen. Christopher F. Bentley, deputy director for operations, National Joint Operations Intelligence Center, Operations Team-1, J-3, Joint Staff, Washington, District of Columbia, to senior advisor to the Ministry of Defense, U.S. Forces-Afghanistan, Operation Freedom’s Sentinel, Afghanistan. Brig. Gen. James E. Bonner, commandant, U.S. Army Chemical, Biological, Radiological, and Nuclear School, U.S. Army Maneuver Support Center of Excellence, Fort Leonard Wood, Missouri, to commanding general, 20th Chemical, Biological, Radiological, Nuclear, Explosives Command, Aberdeen Proving Ground, Maryland. Brig. Gen. Scott E. Brower, deputy commanding general, 101st Airborne Division (Air Assault), Fort Campbell, Kentucky, to deputy chief of staff, communications, Resolute Support Mission, North Atlantic Treaty Organization, Operation Freedom’s Sentinel, Afghanistan. Brig. Gen. Joseph R. Calloway, director, Officer Personnel Management Directorate, U.S. Army Human Resources Command, Fort Knox, Kentucky, to director, military personnel management, Office of the Deputy Chief of Staff, G-1, U.S. Army, Washington, District of Columbia. Brig. Gen. Paul A. Chamberlain, deputy chief of staff, G-8/Director, Resource Management, U.S. Army Central, Shaw Air Force Base, South Carolina, to director for Army budget, Office of the Assistant Secretary of the Army (Financial Management and Comptroller), Washington, District of Columbia. Brig. Gen. Ronald P. Clark, deputy chief of staff for operations, Allied Rapid Reaction Corps, United Kingdom, to chief of staff, U.S. Army Pacific, Fort Shafter, Hawaii. Brig. Gen. Steven W. Gilland, deputy commanding general (operations), 101st Airborne Division (Air Assault), Fort Campbell, Kentucky, to commandant of cadets, U.S. Military Academy, West Point, New York. Brig. Gen. Kenneth D. Hubbard, director, capability and resource integration, J-8, U.S. Cyber Command, Fort Meade, Maryland, to deputy chief of staff, G8; and director, resource management, U.S. Army Central, Shaw Air Force Base, South Carolina. Brig. Gen. Gary W. Johnston, director of intelligence, J-2, U.S. Special Operations Command, MacDill Air Force Base, Florida, to deputy chief of staff, intelligence, Resolute Support Mission, North Atlantic Treaty Organization; and director, J-2, U.S. Forces-Afghanistan, Operation Freedom’s Sentinel, Afghanistan. Brig. Gen. Omar J. Jones IV, deputy commanding general (operations), 7th Infantry Division, Joint Base Lewis-McChord, Washington, to chief of public affairs, Office of the Secretary of the Army, Washington, District of Columbia. Brig. Gen. Ronald Kirklin, assistant deputy chief of staff, G-4, U.S. Army, Washington, District of Columbia, to deputy chief of staff, G-4, U.S. Army Forces Command, Fort Bragg, North Carolina. Brig. Gen. Donna W. Martin, deputy commanding general, U.S. Army Recruiting Command, Fort Knox, Kentucky, to commandant, U.S. Army Military Police School, U.S. Army Maneuver Support Center of Excellence, Fort Leonard Wood, Missouri. Brig. Gen. Stephen L. Michael, deputy commanding general (Operations), 25th Infantry Division, Schofield Barracks, Hawaii, to deputy chief of staff, G-3/5/7, U.S. Army Pacific, Fort Shafter, Hawaii. Brig. Gen. Jeffrey L. Milhorn, deputy chief of staff, G-3/5/7, U.S. Army Pacific, Fort Shafter, Hawaii, to deputy commanding general, I Corps, Joint Base Lewis-McChord, Washington. Brig. Gen. Kevin Vereen, commandant, U.S. Army Military Police School, U.S. Army Maneuver Support Center of Excellence, Fort Leonard Wood, Missouri, to deputy commanding general, U.S. Army Recruiting Command, Fort Knox, Kentucky. Brig. Gen. Brian E. Winski, director, operations, readiness and mobilization, Office of the Deputy Chief of Staff, G-3/5/7, U.S. Army, Washington, District of Columbia, to chief, legislative liaison, Office of the Secretary of the Army, Washington, District of Columbia. Col. (Promotable) John W. Brennan Jr., chief of staff, Special Operations Command Central, U.S. Special Operations Command, MacDill Air Force Base, Florida, to deputy commander, 101st Airborne Division (Air Assault), Fort Campbell, Kentucky. Col. (Promotable) Neil S. Hersey, director, Joint Cyberspace Center, J-3, U.S. Central Command, MacDill Air Force Base, Florida, to commandant, U.S. Army Cyber Center and School, Fort Gordon, Georgia. Col. (Promotable) Lonnie G. Hibbard, deputy commander (support), 7th Infantry Division, Joint Base Lewis-McChord, Washington, to deputy chief of staff, G-3/5/7, U.S. Army Training and Doctrine Command, Joint Base Langley-Eustis, Virginia. Col. (Promotable) Christopher O. Mohan, director, strategic logistics integration (G-45/7), Office of the Deputy Chief of Staff, G-4, U.S. Army, Washington, District of Columbia, to commander, 3d Sustainment Command (Expeditionary), Fort Bragg, North Carolina. Col. (Promotable) Kenneth T. Royar, chief of staff, U.S. Army Aviation and Missile Command, Redstone Arsenal, Alabama, to deputy commander, 101st Airborne Division (Air Assault), Fort Campbell, Kentucky. Brig. Gen. R. Scott Dingle, deputy chief of staff, operations, G-3/5/7, U.S. Army Medical Command, Falls Church, Virginia, to commanding general, Regional Health Command-Atlantic, Fort Belvoir, Virginia. Brig. Gen. Ronald J. Place, commanding general, Regional Health Command-Atlantic, Fort Belvoir, Virginia, to special assistant to the commanding general, U.S. Army Medical Command/The Surgeon General, U.S. Army, Falls Church, Virginia. Maj. Gen. James. B. Hecker, commander, 19th Air Force, Air Education and Training Command, Joint Base San Antonio-Randolph, Texas, to commander, 9th Air and Space Expeditionary Task Force – Afghanistan; commander, North Atlantic Treaty Organization Air Command – Afghanistan; director, Air Forces Central Command’s Air Component Coordination Element for U.S. Forces – Afghanistan, Air Combat Command and support of North Atlantic Treaty Organization’s Operation Resolute Support; and deputy commander – Air, U.S. Forces-Afghanistan, U.S. Central Command, Kabul, Afghanistan. Maj. Gen. John M. Hicks, chief of staff, Headquarters U.S. Special Operations Command, MacDill Air Force Base, Florida, to commander, Special Operations Command – Africa, U.S. Special Operations Command, Stuttgart, Germany. Brig. Gen. Walter J. Lindsley, director, logistics, Deputy Chief of Staff for Logistics, Engineering, and Force Protection, Headquarters U.S. Air Force, Pentagon, Washington, District of Columbia, to director, installations, logistics and mission support, Headquarters Air Force Global Strike Command, Barksdale Air Force Base, Louisiana. Brig. Gen. Chad T. Manske, deputy commander, Canadian North American Aerospace Defense Region; and deputy combined/joint force air component commander for 1st Canadian Air Division, North American Aerospace Defense Command, Winnipeg, Manitoba, Canada, to commandant, National War College, National Defense University, Fort Leslie J. McNair, Washington, District of Columbia. Maj. Gen. James C. Slife, deputy chief of staff, United Nations Command and U.S. Forces Korea, Yongsan Army Garrison, Republic of Korea, to chief of staff, Headquarters U.S. Special Operations Command, MacDill Air Force Base, Florida. Maj. Gen. Jeffrey B. Taliaferro, commander, 9th Air and Space Expeditionary Task Force – Afghanistan; commander, North Atlantic Treaty Organization Air Command – Afghanistan; director, Air Forces Central Command’s Air Component Coordination Element for U.S. Forces – Afghanistan, Air Combat Command and support of North Atlantic Treaty Organization’s Operation Resolute Support; and deputy commander – Air, U.S. Forces-Afghanistan, U.S. Central Command, Kabul, Afghanistan, to director, operations, J-3, Headquarters U.S. Northern Command, Peterson Air Force Base, Colorado. Brig. Gen. Paul W. Tibbets IV, commander, 509th Bomb Wing, Air Force Global Strike Command, Whiteman Air Force Base, Missouri, to vice commander, Headquarters Air Force Global Strike Command, Barksdale Air Force Base, Louisiana. Brig. Gen. Christopher P. Azzano, commander, 96th Test Wing, Air Force Materiel Command, Eglin Air Force Base, Florida, to director, air, space and cyberspace operations, Headquarters Air Force Materiel Command, Wright-Patterson Air Force Base, Ohio. Brig. Gen. Russell L. Mack, director, plans, programs, and requirements, Headquarters Air Combat Command, Joint Base Langley-Eustis, Virginia, to vice commander, Headquarters Pacific Air Forces, Joint Base Pearl Harbor-Hickam, Hawaii. Brig. Gen. Ricky N. Rupp, senior defense official and defense attaché, U.S. Embassy, Tel Aviv, Israel, to director, operations and plans, Headquarters U.S. Transportation Command, Scott Air Force Base, Illinois. Maj. Gen. Timothy G. Fay, director, operations, strategic deterrence, and nuclear integration, Headquarters U.S. Air Forces in Europe, Ramstein Air Base, Germany, to vice commander, Headquarters U.S. Air Forces in Europe – Air Forces Africa, Ramstein Air Base, Germany. Brig. Gen. Andrew A. Croft, director, plans, programs, requirements, and assessments, Headquarters Air Education and Training Command, Joint Base San Antonio-Randolph, Texas, to deputy commanding general – air, Combined Joint Forces Land Component Command – Iraq; director, Joint Air Component Coordination Element – Iraq to Combined Joint Task Force-Operation Inherent Resolve; and vice commander, 9th Air Expeditionary Task Force – Levant, Southwest Asia. Brig. Gen. Matthew C. Isler, deputy commanding general – air, Combined Joint Forces Land Component Command – Iraq; director, Joint Air Component Coordination Element – Iraq to Combined Joint Task Force-Operation Inherent Resolve; and vice commander, 9th Air Expeditionary Task Force – Levant, Southwest Asia, to assistant deputy commander, 9th Air Expeditionary Task Force, Air Combat Command, Shaw Air Force Base, South Carolina. Brig. Gen. Mark K. Johnson, commander, Oklahoma City Air Logistics Complex, Air Force Materiel Command, Tinker Air Force Base, Oklahoma, to director, logistics operations, Defense Logistics Agency, Fort Belvoir, Virginia. Brig. Gen. Tom D. Miller, vice commander, Air Force Sustainment Center, Air Force Materiel Command, Tinker Air Force Base, Oklahoma, to commander, Oklahoma City Air Logistics Complex, Air Force Materiel Command, Tinker Air Force Base, Oklahoma. Brig. Gen. William A. Spangenthal, director, Secretary of the Air Force; and chief of staff of the Air Force Executive Action Group, Headquarters U.S. Air Force, Pentagon, Washington, District of Columbia, to director, plans, programs, requirements, and assessments, Headquarters Air Education and Training Command, Joint Base San Antonio-Randolph, Texas. Brig. Gen. Andrew J. Toth, assistant deputy commander, U.S. Air Forces Central Command; and assistant vice commander, 9th Air Expeditionary Task Force, Air Combat Command, Shaw Air Force Base, South Carolina, to director of operations, Headquarters Air Combat Command, Joint Base Langley-Eustis, Virginia. Maj. Gen. Michael T. Plehn, chief of staff, Headquarters U.S. Southern Command, Miami, Florida, to vice commander, Headquarters Air Force Special Operations Command, Hurlburt Field, Florida. Maj. Gen. Scott F. Smith, deputy chief of staff, operations, Headquarters Allied Joint Force Command, North Atlantic Treaty Organization, Brunssum, Netherlands, to director, current operations, Deputy Chief of Staff, Operations, Headquarters U.S. Air Force, Pentagon, Washington, District of Columbia. Brig. Gen. Mark A. Baird, vice commander, Space and Missile Systems Center, Air Force Space Command, Los Angeles Air Force Base, California, to director, space programs, Office of the Assistant Secretary of the Air Force (Acquisition), Pentagon, Washington, District of Columbia. Brig. Gen. Kirk W. Smith, director, force management and development, Headquarters U.S. Special Operations Command, MacDill Air Force Base, Florida, to deputy commander, Special Operations Joint Task Force – Afghanistan, U.S. Forces – Afghanistan, Kabul, Afghanistan. Brig. Gen. Patrick J. Doherty, commander, 82nd Training Wing, Air Education and Training Command, Sheppard Air Force Base, Texas, to commander, 19th Air Force, Air Education and Training Command, Joint Base San Antonio-Randolph, Texas. Brig. Gen. Dirk D. Smith, director, Air and Cyberspace Operations, Headquarters Pacific Air Forces, Joint Base Pearl Harbor-Hickam, Hawaii, to deputy commander-operations and intelligence, Combined Joint Task Force-Operation Inherent Resolve, U.S. Central Command; and commander, 9th Air Expeditionary Task Force-Levant, Air Combat Command, Southwest Asia. Brig. Gen. Stephen C. Williams, commandant of cadets, U.S. Air Force Academy, Colorado Springs, Colorado, to director, Air and Cyberspace Operations, Headquarters Pacific Air Forces, Joint Base Pearl Harbor-Hickam, Hawaii. Maj. Gen. Bradley A. Becker, commanding general, U.S. Army Military District of Washington; and commander, Joint Force Headquarters-National Capital Region, Washington, District of Columbia, to chief, Office of Security Cooperation-Iraq, U.S. Central Command, Iraq. Maj. Gen. Randy A. George, deputy director for regional operations and force management, J-35, Joint Staff, Washington, District of Columbia, to commanding general, 4th Infantry Division and Fort Carson, Fort Carson, Colorado. Maj. Gen. Ryan F. Gonsalves, commanding general, 4th Infantry Division and Fort Carson, Fort Carson, Colorado, to deputy commanding general, III Corps, Fort Hood, Texas. Maj. Gen. Michael L. Howard, director, Force Management, Office of the Deputy Chief of Staff, G-3/5/7, U.S. Army, Washington, District of Columbia, to commanding general, U.S. Army Military District of Washington; and commander, Joint Force Headquarters-National Capital Region, Washington, District of Columbia. Maj. Gen. Walter E. Piatt, director of operations; and director, rapid equipment fielding, Army Rapid Capabilities Office, Office of the Assistant Secretary of the Army (Acquisition, Logistics and Technology), Washington, District of Columbia, to commanding general, 10th Mountain Division (Light) and Fort Drum, Fort Drum, New York. Maj. Gen. Leopoldo A. Quintas Jr., deputy chief of staff, G-3/5/7, U.S. Army Forces Command, Fort Bragg, North Carolina, to commanding general, 3d Infantry Division and Fort Stewart, Fort Stewart, Georgia. Maj. Gen. James E. Rainey, commanding general, 3d Infantry Division and Fort Stewart, Fort Stewart, Georgia, to assistant deputy chief of staff, G-3/5/7, U.S. Army, Washington, District of Columbia. Brig. Gen. (Promotable) Sean M. Jenkins to deputy commanding general for operations; and chief of staff, Installation Management Command, Joint Base San Antonio, Texas. He most recently served as deputy director for operations, U.S. Central Command, MacDill Air Force Base, Florida. Brig. Gen. John S. Kolasheski, commandant, U.S. Army Armor School, U.S. Army Maneuver Center of Excellence, Fort Benning, Georgia, to deputy chief of staff, G-3/5/7, U.S. Army Forces Command, Fort Bragg, North Carolina. Brig. Gen. David A. Lesperance, assistant commanding general-Support, 1st Special Forces Command (Airborne), Fort Bragg, North Carolina, to commandant, U.S. Army Armor School, U.S. Army Maneuver Center of Excellence, Fort Benning, Georgia. Brig. Gen. Kevin B. Kennedy, director, Cyberspace Operations and Warfighting Integration, Office of Information Dominance and Chief Information Officer, Office of the Secretary of the Air Force, Pentagon, Washington, District of Columbia to deputy chief information officer, Command, Communications and Computers (C4) and Information Infrastructure Capabilities, Office of the Secretary of Defense, Pentagon, Washington, District of Columbia.